India, the world's largest democracy, has a very diverse population, geography and climate. India is the world's second most populous country, and the world's seventh largest country in area. Bobby Jindal, only the second Indian American to serve in the U.S. Congress, has a resume as impressive as some politicians in their 60s or 70s. Yet Jindal was only 33 when he became a congressman. By then, he had already run for governor of Louisiana and almost won, directed a system of universities in Louisiana, a huge department of state government, and a national commission made up mostly of U.S. senators and congresspeople. Jindal was born in 1971 in Baton Rouge, Louisiana, to parents who had just moved there from India to attend graduate school. They gave him the name Piyush, but when he was four, he told them he wanted to be called Bobby, after Bobby Brady in the television show The Brady Bunch. 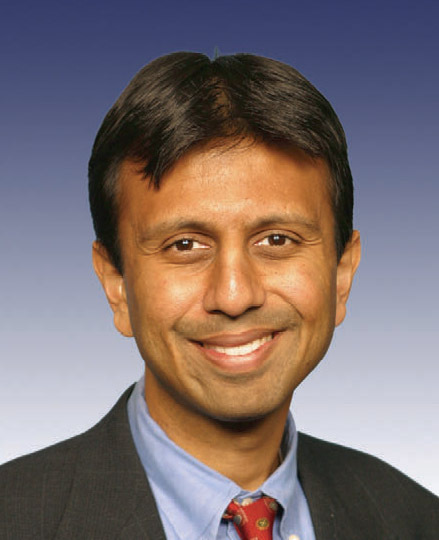 Though his parents are Hindu, Jindal converted to Christianity in high school. He attended Brown University, then went to England as a Rhodes Scholar for graduate work at Oxford University. Jindal was sworn in as Governor of Louisiana on January 14, 2008.He was elected Governor of Louisiana on October 20, 2007, with 54 percent of the vote in the primary, winning 60 of 64 parishes.Shortly after taking office, Governor Jindal called a Special Session to address comprehensive ethics reform, the cornerstone of his election platform. Since the conclusion of the session, the Better Government Association and the Center for Public Integrity announced that Louisiana’s new ethics laws are among the best in the nation. 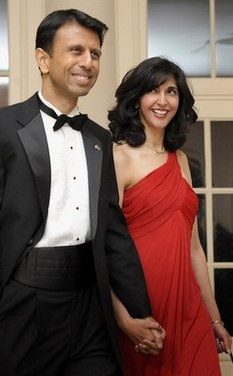 Bobby Jindal is the governor in the US and his wife Supriya, who is also 37, is the youngest first lady. She was born in India—her mother was a stay-at-home mom, her father an engineer—and moved to Baton Rouge when she was four years old. She worked in a chemical plant in Louisiana while earning her MBA from Tulane. She married Bobby in 1997. Unfortunately, Bobby’s recent response to President Obama’s national address received mixed reviews, putting the governor and his wife in the media spotlight. there have been many criticisms against Bobby Jindal regarding his adoption of catholic religion and Indian community standing against it...but to me before any religion a good human is more important ,irrespective of the fact where or what religion we come from,I think good and noble deeds makes us a divine person whether its catholic or Hindu. Labels: bobby jindal, governor Louisiana, immigrant, India. nice biography ! i hardly knew about Jindal..
..@ UMa u r online ..u didnt know about bobby jindal...he is so popular...I am trying from last one hr to publish this article ...the ..html is goin crazy ...had hard time in publishing...thanks..
A very well researched article.I knew few things about Booby but very less about Supriya his wife.Thanks to you now i know more about them.I agree with you when you say that before any religion being a good human being is more important .He has made India proud . Harman,thanks for visiting my blog as it lead me to yours.You have a wonderful blog . nice profile pic! what's the cute baby's name? @UMA..its Arianna singh...my cousins daughter...new baby in the family... she is adorable ...I miss her soo much they moved to Canada! @kavitha..thanks ..yes before any religion stands... A good human being! @Bikram...thanks,,,, BTW..where r u in UK or CHD?